This colourful jumper by Cassie Ward, framed in a Christmas-tree green, is just the thing for cold December nights and cosying up any outfit. 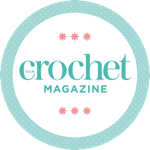 Get started on this fab pattern project with a copy of Inside Crochet issue 96, available tomorrow in all good stores. Want to have your copy delivered to you in time for when it hits the shelves in future? Sign up to a subscription for our paper edition today, or a digital subscription right now.